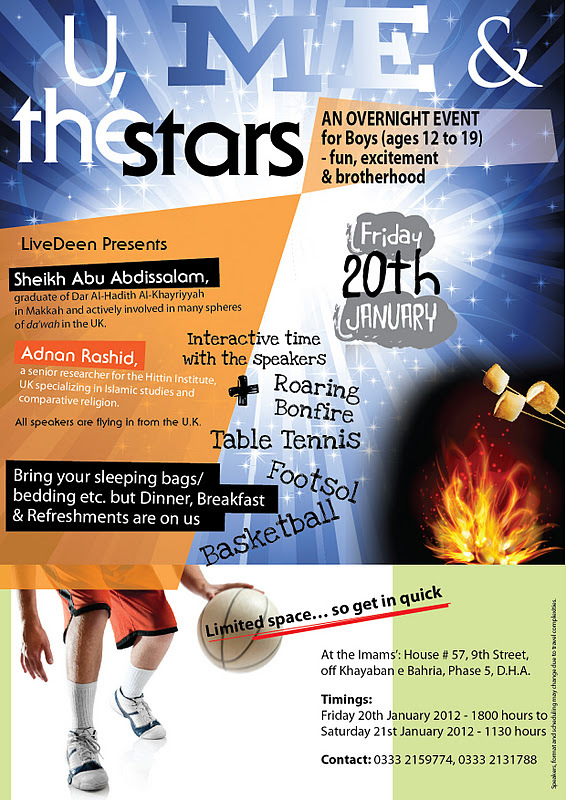 U, Me and the Stars: an over night event for boys 12 to 19 to spend some time with some renowned speakers and chill (the kids assured me it was very chilly). The event began with a talk by Brother Adnan Rashid and then Hisham al Hadi They both spoke in turn, about how they were drawn towards practicing Islaam. Hisham Al Hadi, the son of Dr.Farhat Hashimi, grew up hearing his parents teach Islaam. Yet he admitted that as a child he had some doubts in his mind- doubts about Allah SWT can lead to Hell and so he then spoke to the kids to help them dispel any doubts they may have. Brother Adnan Rashid grew up in UK and explained how he lived in the lap of luxury, eventually started a street gang as a kid and eventually found his boredom heading him towards depression. On the other hand he was very close to his grandfather who lived in Pakistan and spent time with him in a village. Farming was his grand father's hobby and Adnan learnt much from him. His grandfathers death had a profound effect on him, his father pointed out how no money in the world could prevent death, his live was much changed by that thought. The kids were then divided into two groups where the elder group were then addresses by Adnan Rashid and the younger group by Hisham Al Hadi. Delicate matters such as interacting with non mehrum was also discussed, Mash'Allah. The talks were interactive and the boys got an opportunity to interact with the speakers on a one on one basis as well, Masha'Allah. They were impressed by their stories and easy going manner as well, Masha'Allah. The rest of the night was spent playing basket ball, table tennis (QBAP and a freind took advantage of a empty table tennis table as their friends slept) and chatting with friends. Another high "light" of the night were the three bonfires which the kids took turns sitting around and roasting marshmallows with. (there was something very smoky about the pair when they came home......ugh! a pair of socks tucked into their night bag!) the boys played, slept and were later aroused for tahajud, Masha'Allah. The following morning they were addressed by Sheikh Abu Abdissalam , who arrive straight from the airport. He spoke to the kids about his journey to enlightenment, which began from a book called "Do you know this book?" It got him reading and thinking and craving for more. Being one who enjoyed reading the scientific aspect of things he marveled when he found his school teachers address facts he had already read about in the Quran Subhan'Allah. Dinner was a delicious spread of lasagna, chicken botis, seekh kababs and soft drinks. Breakfast consisted of a tasty meal of halwa, aloo puri, channa and puri. Coffee, tea, sandwiches, brownies and hot chocolate were made available all night, Masha'Allah. There were some hot words and teasing as is to be expected when a large number of young boys who are not all acquainted with each other must spend time together, but over all the event when smoothly and the boys enjoyed the novel experience. ABAP suggests that further such events should also include quizzes and role play, which they enjoy (and is also an effective ice breaker) at Active Saturday night outs. We appreciate the Live Deen team's efforts and look forward to more such events for the youth of today, Insha'Allah. jazakumullahu khairaa for such a detailed analysis. Alhamdulillah it was wonderful sharing the night with the boys (through your mail). I hope we have more scholars/speakers visiting so we can do more of these events, inshaAllah.